By now, texting acronyms like LOL and OMG are pretty pervasive in pop culture; my daughter knew them in preschool, you hear them from the least hip anchors on TV morning shows, and heck, your own parents probably have texted you an LOL at some point. But when you’re the parent of a tween or teen, and you’re keeping careful track of who – and what – they’re texting, it’s good to be able dig a little deeper. 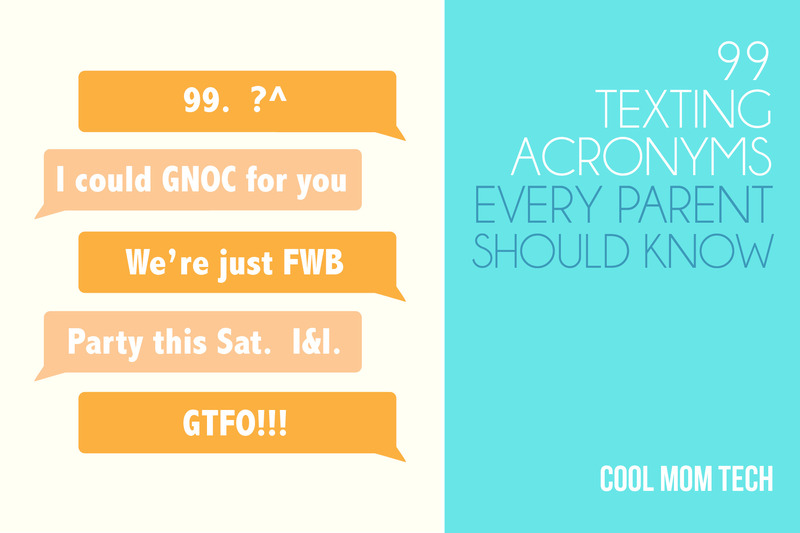 Here, 99 texting acronyms and expressions that every parent should know. It’s not complete by any means, but it’s a start. Of course, lots of text speak will vary by region or even school or peer group. This is really just to help you understand that this kind of language exists in the first place. And yes, there will be completely new ones by the time you have these memorized. Wily kids. ?^ Want to Hook Up? DYHAB/G Do You Have A Boyfriend/Girlfriend? WTTP Want To Trade Pictures? *Note that most sexual Internet abbreviations are derived from dating sites and message boards. You’re more likely to see them on apps like Tinder than on texts to friends. Related: 8 shocking statistics about kids and online behavior that will make you want to have another tech talk, now. CICYHW Can I Copy Your Homework? WTPA Where’s The Party At? BYAM, this is GR8! As a non-tech 303, I love the insider 411, KWIM? W2G! 10Q for this comprehensive list. It’s amazing that an entirely new language has grown up around social media. I will definitely be passing this on to my Baby Boomer followers. hey teens, guess what? 420 is not a secret!! We will know that one! Most common usage “Guy” is For the Win. Unless, evidently, you are in a biker gang? Ed: As an internet “guru” doing it from b4 there was a web and sons in the trade – well connected – IDGAF about what the urban dictionary says – ask a hundred teens that WTF! Means and it’ll be What the F#ck! for 98 of them. I see it used quite frequently, in context, and use it myself, of course YMMV. Great article though, even I saw one I didn’t already know. As a teen, I’ve only seen 3 of these used with out sarcasm. We will always be ahead of adults. That’s how it has always been, that’s how it will always be. Cant wait for the day you are an adult, Rachel. 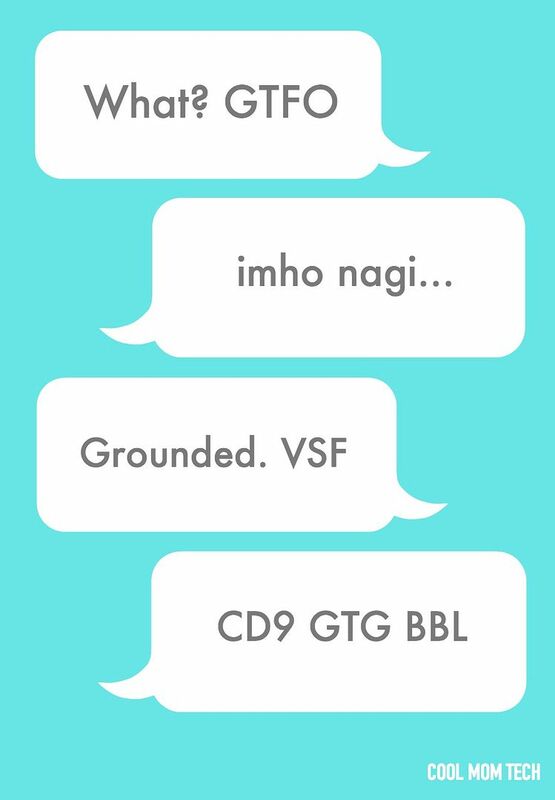 But seriously, I’m an adult and most of these look like the acronyms used over 10 years ago on AIM and message boards. Ok god i have to say it. Im a sixteen year old girl and we use maybe a tenth of those. Me and my friends were seriously shocked and laughing our asses off (or lmao-ing) because this was so ridiculous. Ok so for example – can i copy your homework? We dont care. We will flat out ask: can i copy your homework. If a two kids wanna hang out, they will say: hey lets hang out. Not some big secret k? Yeah.. I’m 18 and as a teenager I can honestly say that we don’t text like this. Especially the “parent” section. Less than half of these are used. However, I can say that I totally understand why a parent would feel like they need these. This world is changing, and not for the better. I’m pretty sure most of these were made up by some mom. Never in my life have I heard of most of these acronyms. These are all made up. I know this for fact, because I just put them in front of 30 teens. Not one response. As we said, slang of any kind will vary by state, by region, and even by school. So yes! They were all made up…by someone. Who is using them. We’re sure that in Canada, where you are, you have your own abbreviations.